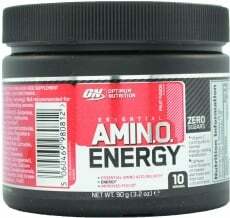 Use coupon "SAVE10" on Amino Energy 90g and save 10%. Have a question about Amino Energy? What is it, what does it do, how and when to use or something else? Ask us. “2x Amino Energy 90g” is currently out of stock. Enter your details below and we will let you know when it's back in stock. Mix two scoops of Essential Amino Energy in 300 to 350ml of cold water. For an amino acid boost: Consume one or more servings first thing in the morning and/or between meals. For pre-workout energy: Take 1-3 servings 20-30 minutes before training For post-workout recovery: Take 1-2 servings immediately after training. WARNINGS Amino Energy : Keep out of reach of children. These statements have not been evaluated by the Food and Drug Administration. This product is not intended to diagnose, treat, cure, or prevent any disease.